There are 54 reader responses to "By the numbers: My spending for January 2019". Thanks J.D for the honest reality check – Personally I am still working on the FI part of life with my family and it’s comforting to know that despite the head knowledge, all of us can succumb to “one time” purchases and slow leaks from our budget. Stay strong, keep faith and use the wish lists on websites to manage impulse spending – I do this with Amazon now and it helps immensely. We appreciate your blog and all you do – Thanks. Of course there is value from these posts – opportunities for random people on the internet to criticize! As it were, I don’t tire of the house valuation comments, because I am in a similar situation (purchased at $256k in 2016, net repairs/improvements of $55k but currently appraised by tax office at $202k, thanks to Harvey). I do have a question on your analysis – you are comparing the current Zillow value to the actual purchase price…did the actual purchase price match the Zillow value at the time of purchase? Does your appraised value for property taxes match the Zillow value? Fortunately, I’m steeled to this sort of response. My spending and priorities are not your spending and priorities. And vice versa. In the olden days, I would have taken any criticism to heart. Nowadays, I realize that what matters most is that I’m meeting my own goals as best I can. Zillow consistently undervalues our home- by a LOT (I see the valuation because I use Mint). We are across the river from Portland, OR. Our house happens to be on a greenbelt with a ‘territorial’ view, and our little pocket of neighborhood has home with higher values than most of our immediate area. My current added asset value in Mint to make up for Zillow’s shortcomings is $100K! A couple of other services show realistic values, and our property tax valuation is well over what Zillow says, so I’m very confident in their lack of nuance. So I’d take their valuation with a grain of salt on the rim of a margarita glass.. The point of current taxes is huge to me. In my last home we could fight inflated property taxes with information about current sales in the area. Zillow may be off base, but it does give a starting point. Personally, I liked it when Zillow undervalued my home. My courthouse fights were a bit easier using Zillow. OTOH- good job at the drop in food and the hard look at beverage intake. I love these kinds of reports where people make honest assessments of what to cut back on. Regarding sleeping at night, I bought a weighted blanket for my husband’s birthday as it is supposed to help relax people who have trouble falling asleep. We haven’t tried it yet but I figure better sleep is worth a shot. You definitely look better, for what it’s worth. It’s a process. You know it. Stick with it. Health and stuff, too. Six hours? Did you forget the basin wrench? If it makes you feel better Zillow says my house is worth 4% more than we paid for it in 2006 (doesn’t include what we’ve put into it). I don’t think it’s quite right as we have a weird neighborhood and likely isn’t great with comps. But that’s the story. And does Zillow reflect the seasonal slump? Is there a reason you’re using MJ every night? I worry about anything that one can become dependent on for sleep. I’m sure it’s healthier than many other alternatives but habits with such things can become problematic. So, I bought the replacement faucet several weeks ago. I knew what we needed/wanted, so I picked it up while I was at home depot. I suspected that removing the old faucet was going to take time, so I waited until I had a free Saturday. I started work at 10:00. You are right, S.G., that I did not have a basin wrench. I started with the tools we already owned. 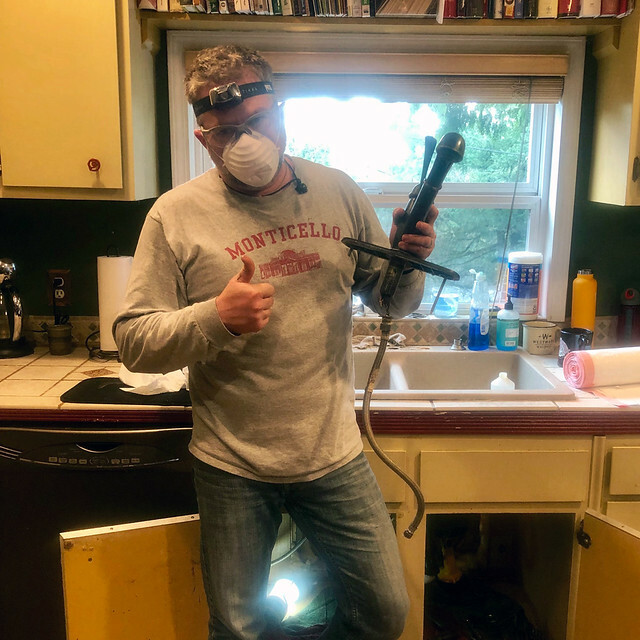 I crawled under the sink — which was damp and moldy due to the leak — and tried to loosen the large (1-5/8 inch) hex-shaped nut holding the old faucet in place. No luck. “I need channel locks,” I thought, so I drove to the hardware store to buy them. When I returned, I found that I could not use the channel locks to remove the hex nut. I wish I could post a photo here, but the bottom line is that while the channel locks could grip the fastener, there was then no room to turn them. I couldn’t grip the fastener at an angle either because the pipe descended too far and made the move impossible. In desperation, I texted the handiest man I know: Mr. Money Mustache. He suggested I buy a basin wrench (although he called it a “sleeve wrench thingy”). I drove the hardware store to buy one. When I returned, I found that I could not use the basin wrench to remove the hex nut. It was both too small and too large all at once. The diameter of the hex nut was too large for the basin wrench by about 1/8 inch — but that didn’t matter because the outside dimensions of the basin wrench were too big to fit in the space anyhow. Ugh. My friend Bill — who was also part of the text conversation with MMM — suggested I buy a Dremel and use it to chip away at the hex nut. Once I had a notch, I could pound away with a screwdriver. Believe it or not, this worked. After another trip to the hardware store and some cautious grinding on the hex nut, I was able to cut a notch into which I could place a slotted screwdriver head. I pounded for a few minutes until the nut turned. From there, it was just a matter of time. Not having a basin wrench always makes changing a faucet hard. I remember my husband saying so after his first faucet adventure at his mom’s house after we were married (he forgot his at home). I now have the official responsibility to remind him to bring the basin wrench. Home repair is often frustrating. But the more you do the more you learn, or at least the more tools you have to figure it out. 1-Beer is drank in order to study the problem. Each beer consumed = apx 1 hr of research on how to complete said task. Therefore a 6pk should equal about a days worth of investigation. 2-Project begins – beer is best left sitting in the fridge at the moment at the beginning of the project. This gives the appearance to the wifey that you’re serious about getting it done. 2a-tools and parts spread out, sweat has begun, ahh time for a beer. If you keep a semi serious look to you, it’ll pass as you are taking a break but studying the issue at hand. Therefore deterring any questions as to why you have stopped. Did you figure the opportunity cost of DIY repair vs. working on GRS for the day and paying a pro to do this? I’m looking not just at the 6h actual labor but time doing research, shopping trips, etc. Pretty much a day’s work yes? So… would you David Ricardo-it? If you’re going to do that you also have to take into account the value of the knowledge gained as well as the opportunity costs. Many people refuse to build a competence at home repair based on the theory that their time is more valuable. However personal time isn’t measured in dollars, it is measured in the alternative use of the time (opportunity cost). In fact if repairing the sink kept JD from shopping on iTunes, the alternative use of his time could be negative ;). The only way to trade it for value is if he literally would have spent the time working for a wage. And six hours this time does not compute to six hours next time. Because, should he need to change another faucet, then he now has knowledge and tools to hopefully do it much more quickly. That six hours is what I call “tuition in the school of life”. What he learned has value, and unfortunately the cost was six hours of opportunity to do something else. Ricardo would apply even if you’re competent at both. See, in Ricardo’s original example, Portugal had an absolute advantage but still benefitted from trade, as did England. Maybe tuition in the School of Economics is more valuable… just wondering if it applies here. Ha! More than you’d think if you’re good at it. And the skill isn’t necessarily specific to faucets. I’ve never needed to change a sink in my life. But I do minor car repairs because it’s something I use regularly, and the alternative is expensive, and even when I go to a shop I know what’s going on and what I’m paying for. However, for some people it would be a waste of time and money to do the repairs themselves and they’re better off just having their assistant drop it off at the dealer or whatever. My question has more to do with– at what point is worth doing something yourself and at what point are you better off letting a specialist deal with it? I enjoyed the discussion about opportunity cost. You need to take a lot of things into account in order to determine the real “cost” of something. J.D. could have paid a plumber to do the job and spent the time he saved buying things on iTunes. Not that would have been expensive! Yes! That’s the calculation I’m curious about. Like I said, could make up a whole article. JD buys things on iTunes? Haha ha . Why? I though I read he needed to work on the blog…. El Nerdo – Using your car repair example, I’d say there is a great deal of benefit to learning basic repairs yourself if for no other purpose than keeping the auto-mechanics you hire later on honest. Outside of the car repair example, I have a different answer to your question. I see this dilemma all the time at work. We’re a start up company (if you can still call us that, we’re 20 years in) and “boot-strapping” gets a ton of respect around here. We default to DIY rather than hiring experts, and as we’ve matured we’ve built quite the arsenal of unsupported, sub-par tools we’ll have to live with for the foreseeable future. For me the answer to when to hire an expert and when to DIY is if you’re unlikely to use the exact skill set again and you’re going to have to live with the consequences for years, it’s best to hire an expert. Wishing you the best on your efforts this year to get your money and health in better order! I know you can find ways to eat healthy food and cut your food expenses, and cutting alcohol expenses will also benefit both of your goals. I’ve always felt the “less is more” approach to be true! That dining out looks good JD! I’m presuming you separated out the alcohol portion from those meals out into the “sin” category? Still, a good number (especially if you’ve always done that). As far as these monthly posts — I think most people enjoy seeing what people have changed to reflect less spending (and what they’ve encountered that forced them to spend more). But it also seems like a lot of people who are open about monthly spending see it as accountability. I’m not sure how you feel about that part, but just a thought. I think you’re off to a great start! I really need to start tracking expenses again. We’re naturally frugal and hovering around FI but I have a feeling we’re spending more in some departments than I suspect (namely groceries with two teenage boys in the house). Teach the pets some basic plumbing skills. Everyone has to do his share. You spent $2610.01 more this month than I make in a month: your spending was more than twice my monthly income. Between food and ‘sin’, you spent a mere $77.54 less than one of my entire paychecks. I am a trained chef, with an associate’s degree from the CIA, I have worked in this field for 24 years. This is the most I have ever been paid, nearly $20/hr, plus benefits. I understand that there are massive discrepancies and differences in how people are paid, across professions, and across the country. But I get paid at LOT more than a lot people working in their chosen profession, and a disgustingly large amount more than people who work in other service professions, and do the work that keeps this culture able to function. I have no debt, I budget less than $700/month on spending (which includes food, beer, pets, gas for the car, and all other incidentals), and aim to spend less than that. My mortgage is $715 (an unbelievably low cost in this area for rent or mortgage), and my bills are $200-$250/month: 2GB cellular, power, water/sewer, internet. $1615-1665 on the low side, which leaves $544-594 for saving, investing, and unusual incidental expenditures such as emergencies/large car/house repairs. I feel RICH to have this much left over, after years of breaking even (still with no debt and extremely cautious spending). It would be pretty great to occasionally see articles that reflect even this level of financial income….let alone for the former me, who had never made more than $30k/year, always working full time and as either a chef, or wildland firefighter/ski area lift operations supervisor. I agree, Betsy. I’d love to see articles that explored earnings, saving, and spending from a variety of socio-economic positions. I can only really write about my own experience, obviously, both today and in the past. But I can certainly find other folks who’d like to share their experiences. It’s on the long-term list of things to do around here! I’m on the other side – live in a higher cost of living city, and my budget includes things JD didn’t include (an allocation for auto insurance, utilities, an allocation for property tax, home maintenance costs, and baby stuff to name a few. JD, what do you buy on iTunes? If it’s just movies, there are much cheaper ways to watch a lot of movies. My recent favorites are dvd.com or redbox. dvd.com just sends them to you in the mail – if you watch them same day you get them you can get 6-7 movies per month for $12. And they have a huge selection. I use redbox for more “I want to watch right now” situations. Those are $2.5-$3 and I have to go pick them up and their selection is more limited, but then I don’t have to wait. Those may be good options to cut back on cost without cutting back something you enjoy (though you don’t get to own the movie). I think JD addressed that in the comments of another post recently. He likes adding to his library of movies. It’s always fascinating to compare people’s hobbies and the financial impact. I rarely ever watch a movie twice so there is no need to own them. Just this weekend we were cleaning out a kid’s closet (we’re empty nesters now) and found about 10-15 DVDs we’d purchased when they were younger. To goodwill they went. I believe the Sports Night DVDs are the ONLY entertainment (of any media type) that we now own. Of course, I don’t think we even have a DVD player connected to a TV, so probably dumb to keep the Sports Night DVDs too. I suppose not being a collector of anything is certainly an advantage from a frugality standpoint. I will say, smart phones are a blessing when trying to get rid of clutter that might belong to someone else who lived in your home. We have a group chat and I just post the photos and get the yay or nay to get rid of stuff. I can do division so I figure out your net worth, I know, that’s nosy of me, sorry. But since we’re counting zillow valuations, I can say my house in Hood river has appreciated by $117,000 since we bought it in 2016, so I can’t complain there. Figuring it all out, I think my net worth is still only at about 1/3 of yours J.D. I know it’s not a competition, but it’s hard not to compare. I guess I’ve got about 10 years to catch up. My wife and I were discussing this today. I recently got a raise, so we were discussing how to allocate the money, and actually how to allocate *all* our money, and we decided to accelerate savings and paying off the mortgage aggressively. We could imagine having the house paid for in roughly 8 years, which would be awesome. We might have to reign in our spending on world travel a bit though. We’ll see how well we actually do with that. Zillow valuations very rarely actually represent the true market value of a home, so don’t let it get you down! If you want to know the market value, ask your agent. They will be able to tell you (for free.) Source: Realtor here. Could be the secret accountant in me, but I enjoy spending recaps. I like numbers. Yikes! What is this magical game that consumes all of your spare change!? There are more out there than you think. I am aware of a half dozen off the top of my head, and I’m sure there are dozens, if not hundreds, more. I believe most console games now have enough in app purchases to make them more of a gateway than a full game. My husband plays Clash of Kings. He has spend a few dollars on it, but he plays with plenty of people around the world that have spent 10s of thousands of dollars on it. I know my parents could look at my spending and say “I can’t imagine….”, but I’ll go ahead and say it… cannot even fathom spending this much time or money on such things. We have (grown) kids that both play console games and one that we have worried about in regard to the extra spending. It’s been interesting to realize that starting with people about 10-15 years younger than us, that you don’t actually “outgrow” gaming. Fascinating. I don’t know anyone “our age” (50s) that games, but I feel like that changes just about 10+ years behind us. Understood. But they’re set up to do so. When you are in a real time battle with a real person on the other side of the world it’s easy to drop money on it. It’s not unlike spending a lot when you’re out drinking with friends. You dont even realize you’re dropping thousands until the credit card statement comes. And being worldwide, there are a lot of rich people (and their kids) who set the pace on spending. Then a good number of less rich people spending to keep up. You dont even realize you’ve paid as much for your virtual castle (that has no real value depreciated or otherwise) as a real one. Marvel’s Contest of Champions. Think of it as Street Fighter with Marvel characters. Horribly addictive because of the social aspect of the game. As for my property…over 1M in 2016. Currently valued at 829k. 160k left on the mortgage and my motivation to pay it off dwindles every month. I indulge in too much Stoli Elit if I dwell on that. Nice job on being more mindful. We’re moving and we’ll spend plenty of money in the months to come. I want to replace the kitchen faucet too. Hopefully, I’ll get it done under 2 hours. I’ve done it before so shouldn’t be too bad. Why did it take you 6 hours? Some kind of problem under the sink? Congratulations on making progress! Dropping your food spending by 32% is a huge month-over-month change. Hint: separate non-food grocery items (paper products, detergent, hygiene items, etc.) into a separate Household category, if you don’t already. That way the comparison of food-at-home to food-out is more accurate. You’re right about cats being expensive pets, foodwise. Being obligate carnivores – and finicky ones at that – their food is just pricier. I spend close to $200/month on food for my geriatric brood, and another $40 on litter. May I suggest Chewy.com if you haven’t already tried them? Virtually every brand is available (including prescription products) and at lower cost than the national pet marts. Shipping is free for orders over $49. For me the biggest advantage is having it delivered straight to my door. No more lugging heavy bags of cat litter. Yay! Regarding Zillow, they are often WAY off in their valuations. I have maintained contact with my realtor and once a year ask him to email me a list of recent comps. It’s a much more accurate reflection of current values. Finally, I’m very happy to hear you are addressing the alcohol issue. Will be interested in reading when you are ready to post about it. I enjoyed your monthly report for January. Please feel free to post them. 1) There aren’t as many places to cut living expenses as I think. Not without significantly altering your lifestyle. 2) There are certain expenses that I know we could cut (dining out), but dog gone it, we enjoy ourselves when we go to a restaurant! 3) Your statement “my main aim is to be aware of where my money goes, to track it diligently so that I can make appropriate changes going forward” is very true! It’s also helpful to realize/acknowledge where you *could* make changes if this becomes a necessity rather than a goal. I use YNAB and I have my category groupings going from necessities down to totally not necessities. If I want to cut back, I can budget less as I go down my list, but I can also easily toggle those groupings off/on in the reporting/graphs to see what I *really* could do if necessary. I do something similar. I have an “emergency budget”. If one of us lost our jobs or some other major money shift occurred I know exactly what I would cut immediately. I figure times like that are traumatic enough without thinking that through. I have also noticed that some people don’t change their spending at such a time because they assume everything will be fine fairly quickly, and if it isn’t they are in trouble when they could have been comfortable for far longer if they had just thought of it beforehand. Or they do the opposite and panic. I know a guy who went out and put a bunch of groceries on credit card when he heard a rumor of problems at our company. No one wound up losing their jobs but he was paying on that credit card for a while after buying stuff he didn’t need because he was functioning too tightly between paychecks and didn’t know what he’d do if he lost his job. I hope you DO post monthly updates like this! As a looooong time GRS reader, this sort of follow-along-with-JD’s-progress post is my favorite kind. Also, are we going to see a post about your European vacay at some point? Would love to hear more. I agree with several of the other comments that you should definitely keep posting your monthly spending updates. For me it’s helpful to see what others in similar situations are spending. I’m always amazed at how spending levels can vary among FI bloggers. I think everyone has certain expenses that get way out of whack and sharing that experience is very helpful. Just a thought, and I am in a completely different (much lower) economic place. Because I can no longer bend and reach my feet, my pedicures have become a medical expense, as has my pot (im a medical patient because the taxes are lower, at least in Co). Not to say you should try to justify so called sin spending, but if you are using it for sleep or pain assistance I would not call that sin money. I have a medical expense account (seperate savings account) and that would comeout of there. The rec pot and booze would come out of entertainment in my world (as does dining out, it’s not included in the food budget). I curious…is the $701 food and restaurant spending just for you? If so, does Kim have similar food expenses? Same question for your “sin” spending? JD, I dont if you’ve used it before, but theres an iOS app called Cheap Charts that will alert you when movies, music, etc goes on sale on iTunes. I’ve been wanting to buy the 3x Movie Hobbit collection (Extended edition) which normally is $53.97. I put an alert on it so whenever it goes on sale, I’ll get a notification. It will also show you the historical prices, so you can get an idea of a sale is really a sale or not. I think retirement makes it easier to have a bit too much alcohol or other drugs. When I was employed I had less time on my hands and needed to be sharp on weekdays. Now I have plenty of time to drink and still accomplish what I need to do. If I decide to sleep late or take a nap no big deal. Thank you for keeping everyone updated on your journey. I have wicked insomnia sometimes running for three nights in a row. I tried a lot of medications and finally found Quiniapine to work wonders for me. Bonus for me is it’s only a $10 co-pay with my insurance. It might be financially and health-wise more sound to try prescription drugs. And maybe try a sleep clinic to see if there’s any underlying issue you can address. Better for your lungs, too. I will say I am pro-legalization of marijuana and am really happy to live where it’s legal too in Washington state where it’s helped our tax base immensely. If only the girl scouts would let the troops sell in front of the pot shops I’d be happy. We’ve got one nearby that’s across from the original Costco — sitting ducks for cookie sales! Thanks for the update. I am not retired but somehow with my kids gone to college the “I dont drink on a school night” rule has gone out the window and it can quickly add up even if it is one drink with dinner. Have been trying to track to keep myself honest – and then need a workable solution which may be back to weekends only. I’m late to the party in responding to this post, and hope you are still reading comments! I’ve followed GRS for years and was so happy to see that you had returned. I’m also five years in recovery and would really enjoy seeing you post about how life changes if you do decide to cut out alcohol. It was honestly the best decision I could have ever made (for my personal life, professional life, emotional life, and of course my finances) and it sounds like you’re ready for a change like this. I too want to learn how to be mindful of my expenses. I am in a significant amount of debt at the moment, and I think breaking down what I have spent each month like you have done above will help me in identifying and sealing the leaks so that I can get out of debt faster. And yes, cats are very expensive!